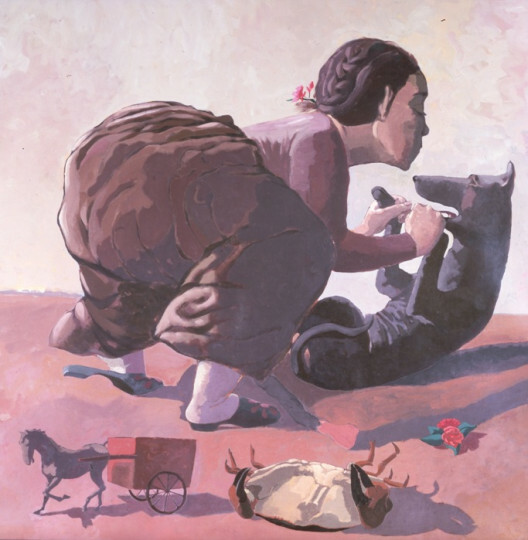 In a letter dated May 1987 Rego wrote that ‘This picture is about what is going on between the girl and the dog, and how the two are placed. There is some ‘looming’ going on because she is concentrating hard on him, her face is very close to his; she is very involved. Her skirt is very important too because it is like a snail’s shell, and it has ‘secrets’. Both girl and dog are washed up, adrift on the sand.